Because there's more to life than all Japan all the time, today we bring you a guest post by one of our readers. 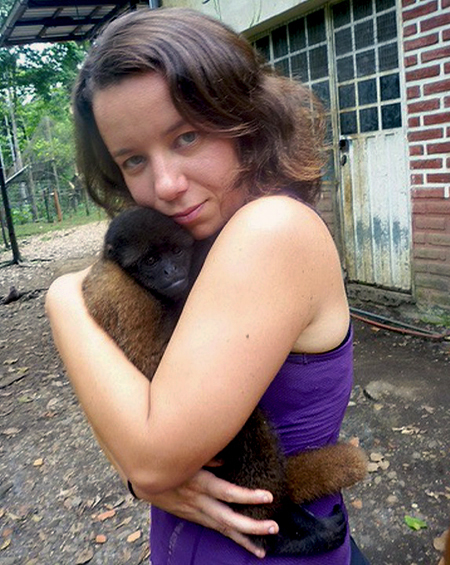 She volunteered at a wild animal rescue in Ecuador, and very kindly offered to write about her experiences there. And of course, the rescue center fits with our volunteering-on-a-budget profile. I wake up at 7:30. A squirrel monkey is staring at me beyond the window. I drink a cup of coffee, eat a fresh pineapple and head to the main house. Five dogs are accompanying me and at the entrance Poncho, a spider monkey, gives me a good morning hug. I grab some fruit, vegetables and plates and start preparing breakfast for the animals. I need to remember to prepare a plate for the baby monkeys, for a sick white capuchin Fernanda, for two babies that still don't go outside the house. Several monkeys are hanging onto the kitchen window, waiting. I go outside with a huge plate and call all the animals - "A comer!!!" (come eat). 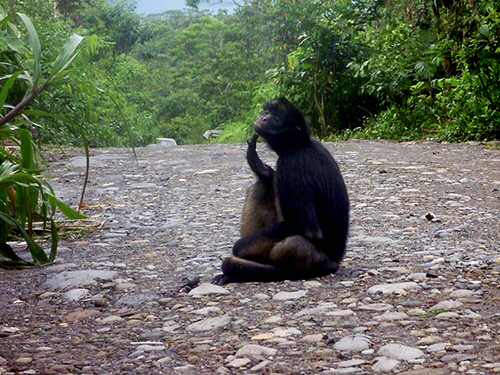 Monkeys from six different species recognize the call and follow me to the regular spot next to the house. They sit together and eat. 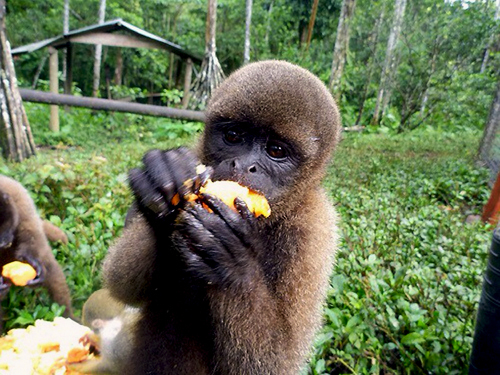 Pancha, almost an adult woolly monkey is afraid of the bigger fellas and seeks my protection. She jumps on my shoulders with a piece of papaya and eats her breakfast on top of my head. Pancha will stay with me for the rest of the day, hugging me, changing positions clinging to my arms and shoulders. 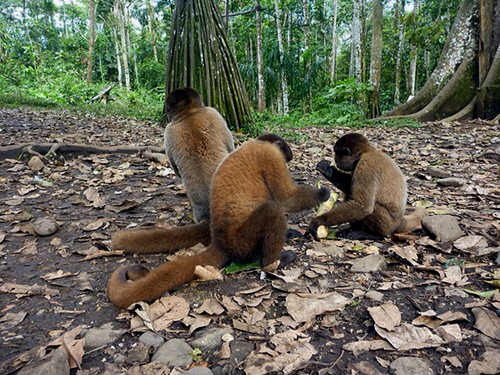 Gigi, a six-month old woolly monkey, and Etza, a woolly monkey that was raised in a small, closed box by some cruel people, and as a result didn't develop enough, are awaken. I feed them both from their plate inside the house. From this moment on, I am in charge of watching both of them, since they can't manage to go outside alone. Gigi is very energetic, she is just learning to climb and jump, but her balance is still not very good. Yesterday she learned to drink from a water cooler and we are all very excited about that. I need to make sure she doesn't climb too high, that other monkeys don't hurt her, that tourists won't try playing with her since they might drop her. Gigi is aware of some of the dangers, so every few minutes she runs back to me and wraps her small tail around my leg, then she feels protected. She recognizes me and never seeks protection from strangers. A group of tourists is coming, I should check what language they speak - maybe I could be their guide around the rescue center. But first of all - make sure Gigi and Etza are being watched and they are safe. A couple of tourists are looking at Etza and asking what is wrong with him. I explain them that monkeys need to spend many hours per day in the sun, so their body will be able to absorb vitamins and develop properly. Maybe next time when these people will see a monkey kept in a small box in some touristy place, they will remember Etza and condemn such cruelty. In few hours we are going to have lunch, always delicious and every day something new - in all the time I’ve been here I’ve never had the same dish twice! Around 4PM we are going to feed the animals again and around five we will gather all the smaller monkeys in a playroom inside the house, where they spend the nights. At six in the evening Poncho will give me a good night hug and I will return to the wood cabin. Tomorrow, with my help, Gigi will learn new tricks, Etza will absorb the sun outside and maybe Pancha will get a little bit braver. 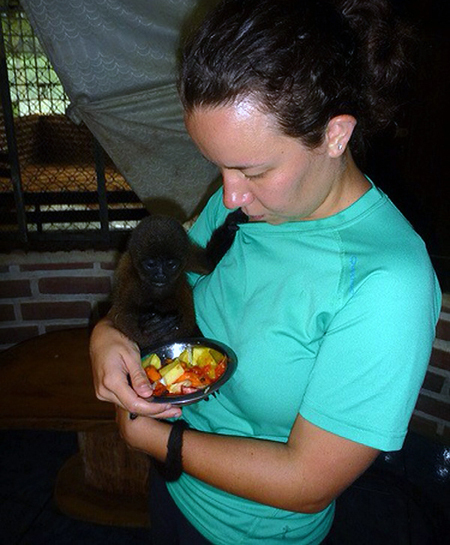 That was a typical day during my volunteering in Paseo Los Monos, a rescue center for wild animals set up by a Swiss-French couple. The center is located in a rain forest near the city of Puyo in Ecuador. There are 64 monkeys from 7 different species here rescued from animal trade, or from being kept as pets in captivity. The center is supported exclusively by charitable donations and a symbolic entrance fee for tourists. 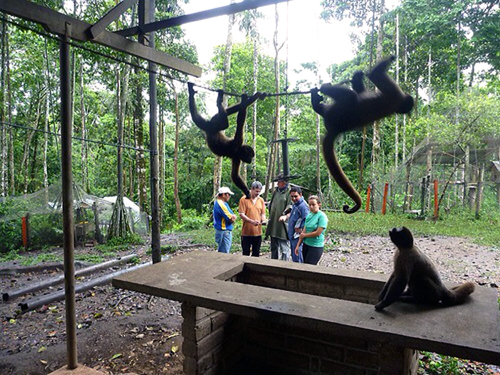 Volunteers are needed to help construct new cages, guide tourists, watch the babies and special needs monkeys, feed the animals, create and build games. The volunteer project costs 100 dollars per week and includes accommodation, all the food (you need to prepare breakfast and dinner by yourself from supplied products), laundry. There is electricity and running water, kitchen and even an internet connection for short usage. During the evenings you can go out to Puyo (there are great local bars and clubs there) or just hang out in the wood cabin. During the day you can wander around the rain forest, walk to the river, smell, feel and touch the nature. Paseo Los Monos is looking for animal loving volunteers. The volunteers should be responsible, sensitive to animal needs, patient and observant. It is possible to get along with English, Spanish or French. There is no minimum stay required but I would recommend at least a week or two.